Patience Wright was an American colonial sculptor who traveled to London and opened a successful art business. While she was there she sculpted many famous people, and secretly participated in the American Revolution. Patience Wright was a poor woman who married a barrel maker and lived in Philadelphia, Pennsylvania. When her husband died, she needed to provide for her children. Having always entertained friends and family with her ability to sculpt candle wax to resemble people she knew, Patience had an idea. She would set up an art display of her work. Working with her sister, Patience created approximately 40 life sized sculptures, put them on display and charged people to enter. Surprisingly, people payed the fee to see her work (there were not a lot of art house in colonial America). The characters she created were extremely lifelike. To add to the effect, Wright put clothing on her creations as well as gave them glass eyeballs. Eventually, her business became so successful that Patience opened a museum in New York City. Additionally, she was able to have a traveling exhibit which went as far south as Charleston. Unfortunately, Wright’s business suffered a fire in 1771 and most of her work was lost. Patience decided the best corse of action was to relocate to England and begin anew. Her talents were welcomed in London, and she set up another popular museum. Wright became so popular, in fact, that she was asked to sculpt King George himself. Patience was one of the few outspoken Patriots living in London during the American Revolutionary War. She wrote letters to important friends back in Philadelphia. Among others, she corresponded with John Dickinson. Wright informed Dickinson about the British preparations being made in the Mother Country. Due to her Patriotic nature, Wright lost favor with the King and was forced to flee Great Britain. Wright went to Paris, where she had the opportunity to sculpt Benjamin Franklin. It just so happens that this was around the time when Marie Tussaud was beginning her career as a wax sculpture. Tussaud also sculpted Franklin and, although I could not find any account of the two women meeting, I feel it is safe to assume they were both aware of each other. Patience Wright returned to London after the American Revolutionary War concluded. A decade later, with the French Revolutionaries beheading everyone in sight, Madame Tussaud sailed for London. Tussaud was extremely successful in displaying her wax figures and today London still has the largest Tussauds museum in the world. It seems to me that Wright’s brief popularity in wax left Londoners thirsty for more, and the door for Tussaud was open. 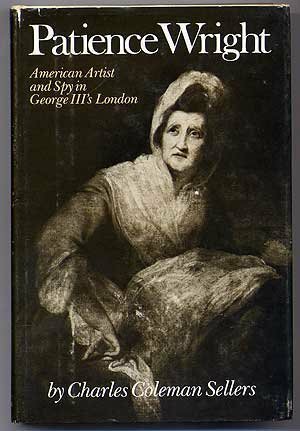 For an in depth look at the life of Patience Wright, give ‘American Artist and Spy’ a read. If you can’t find it at the library, get it through our affiliate link below. Oh, and make sure you subscribe to our email list to have a new article sent to your inbox every day. Patience Wright: American Artist and Spy in George III’s London.